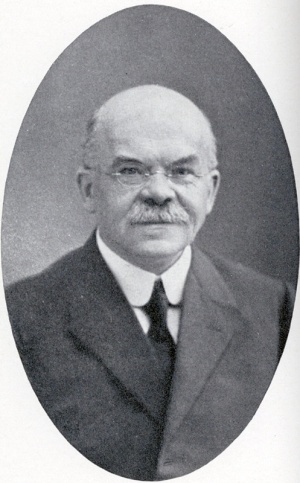 Folpmer Jacob de Holl, born 1869 at Utrecht, died 19 December 1934 at Baarn, was a Dutch Mennonite pastor and theologian. After studying at the University and Mennonite Seminary at Amsterdam, he served as pastor at Mensingeweer 1897-1900, Hindeloopen and Koudum 1900-1903, Den Ilp 1903-1905, Medemblik 1905-1913, Borne 1913-1926, Purmerend 1926-1929, and Leermens-Loppersum 1929-1934. In 1933 he was appointed lector of the Amsterdam Mennonite Seminary, to teach ethics to the theological students, but his teaching was only for a short period, ending by his sudden death in 1934. De Holl was a very learned man. He was a disciple of de Bussy, his teacher at the Seminary, who estimated him highly. De Holl published only one book, De Kennis van goed en kwaad; een gedachtewisseling met de professoren Heymans en Kranenburg (Amsterdam, 1928). Besides this he wrote a number of critical reviews of books on ethics in a number of Dutch periodicals. His historical study on Jan de Liefde was published in Doopsgezinde Bijdragen 1901. De Holl was an amiable man, who was loved by many and whose influence reached much further than the small congregations he served. De Zondagsbode (6 and 13 January 1935). Doopsgezind Jaarboekje (1936): 17-28 with portrait. Zijpp, Nanne van der. "Holl, Folpmer Jacob de (1869-1934)." Global Anabaptist Mennonite Encyclopedia Online. 1955. Web. 25 Apr 2019. http://gameo.org/index.php?title=Holl,_Folpmer_Jacob_de_(1869-1934)&oldid=120077. Zijpp, Nanne van der. (1955). Holl, Folpmer Jacob de (1869-1934). Global Anabaptist Mennonite Encyclopedia Online. Retrieved 25 April 2019, from http://gameo.org/index.php?title=Holl,_Folpmer_Jacob_de_(1869-1934)&oldid=120077. This page was last modified on 13 April 2014, at 03:10.